The last black and gold Bathurst challenger – and a Brock Mobil car to boot! 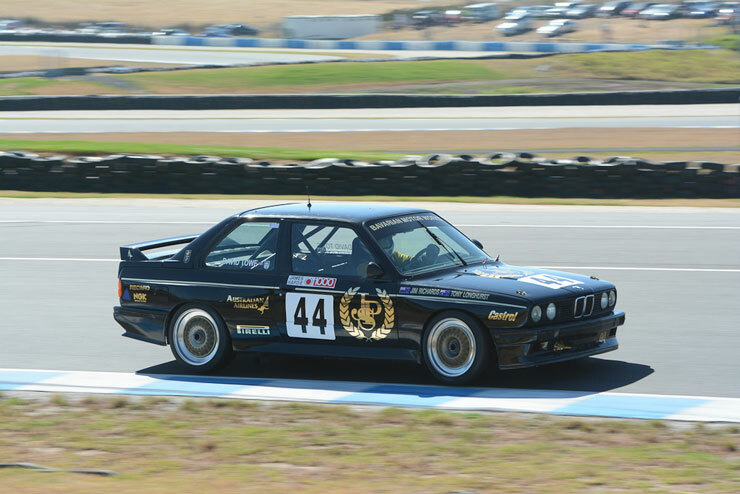 WITH over 100 log booked Heritage Touring Cars covering the Group A and C eras of Australian touring car racing, there are some fantastic stories relating to the histories of the cars in the category. A Historic category that caters for the ‘Legends of Bathurst’, this is the first in a series of stories covering the histories of the cars that make up the HTC field on racetracks across Australia. 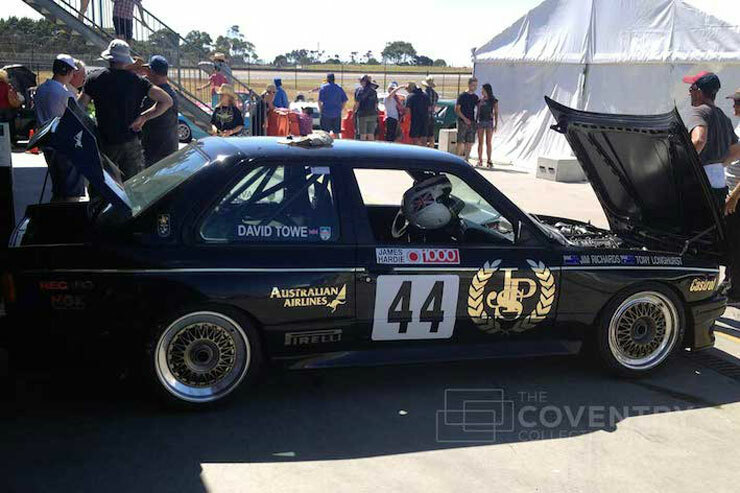 This first story focuses in on the JPS BMW M3 raced by its owner David Towe. Towe’s car was the last M3 built by Frank Gardner’s famous JPS team in Sydney in 1987 with its logbook issued on September 10, 1987. 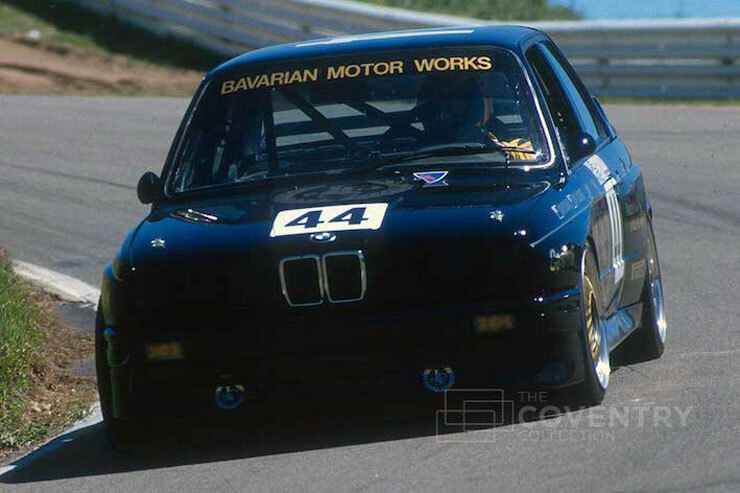 It made its racing debut in the 1987 James Hardie 1000 at Bathurst as the #44 entry of Jim Richards and Tony Longhurst, finishing fourth overall and claiming victory in its class and is believed to have then also raced at the Calder road/oval circuit round of the World Touring Car Championship a week later. 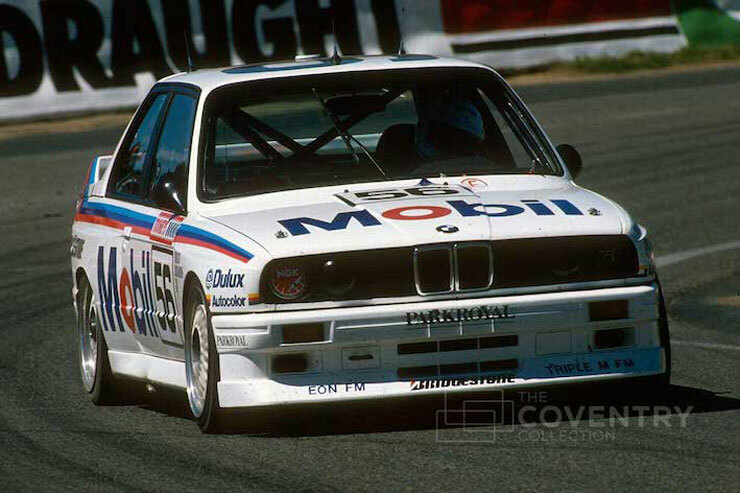 The team was disbanded at the end of the season with Peter Brock’s Mobil team taking over the Australian BMW race program. This car is then believed to have been raced by Brock as the #05 entry in the 1988 Australian Touring Car Championship (after all, it makes sense that Brocky would have raced the newest car!) and then claimed victory at the Pepsi 250 at Oran Park in the hands of Brock and Jim Richards. The duo again ran the Towe car in the Enzed 500 at Sandown though a split oil filter cost the car lots of time and it finished a delayed seventh before it was raced by Brock and Richards at Bathurst that year, though under the #56. 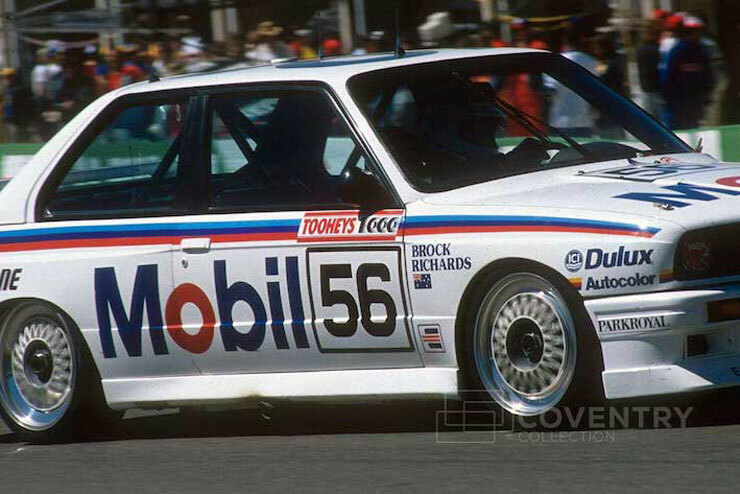 Reports of the time indicated that the #56 Brock/Richards car had been the car raced by Richards as #1 during the 1988 Australian Touring Car Championship, though Towe’s research has found this not to be the case. “The key thing that distinguishes my car as the #56 Bathurst car from 1988 (as well as the #05 Sandown 500 car) is that it has four aerial holes in the roof which were put there for the NetComm telemetry system used in the TV coverage as well as the team radio etc. “All of the stuff put in the car used up four aerial holes and this car is the only one out of the six JPS M3s that has four aerial holes in it. You can clearly see them in the TV coverage and in photos of the car at those events. The race that year was run under FISA regulations as part of the Asia-Pacific Touring Car Championship and Class 2 cars were restricted to running numbers between 51 and 70, hence the change for Brock from his regular #05. This was the first time Brock had not raced at Bathurst in a #05 car since 1977 when he ran #25 for Bill Patterson Racing on its Torana A9X. Richards never actually drove the car in the race given Brock hit an errant wheel on Conrod Straight at speed, delaying the #56 car while it was repaired and prompting Jim to move into the second #57 car started by David ‘Skippy’ Parsons. It failed when Richards climbed aboard, leaving TV commentator Neil Crompton (making his Bathurst 1000 debut) to team with Brock in the many-lap-behind #56 entry. The banter between Crompton, Brock and the entire Seven Sport commentary team lives in infamy today! Brock moved to Ford Sierras in 1989 so this car was sold and raced by privateer John Cotter in Group A and then two-litre guise from 1989 to 1994 at a range of ATCC, AMSCAR, Bathurst and Adelaide Grand Prix events. It was then sold to Paul Nelson who raced it in Faber-Castell colours in the Super Touring series in 1995 and early 1996 before being sold to Nick Rahimtulla in Western Australia, who restored it to its JPS colours and raced it locally for several years. The car was acquired by Sydneysider David Towe in 2010 and runs an engine built by ex-JPS mechanic Pip Barker. 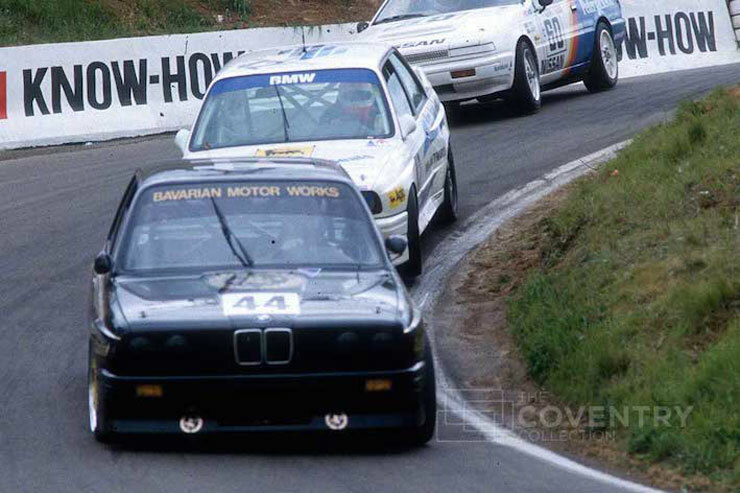 The four-cylinder, 2.3-litre twin cam BMW engine pumps out 300 horsepower and the car runs a five-speed Getrag gearbox – though it did use a six-speed Prodrive unit at Bathurst in 1988 when driven by Brock and Richards for the Mobil 1 Racing team and later by Doulman and Cotter’s M3 Motorsport squad. 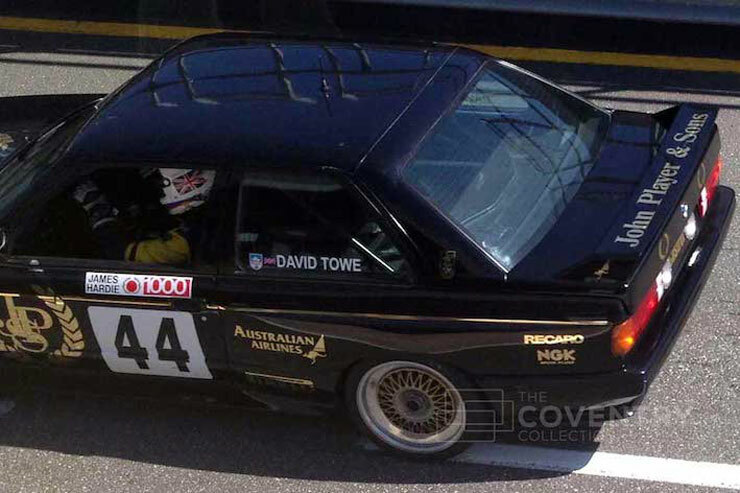 Towe’s JPS BMW M3 will next be in action in Round 2 of the Heritage Touring Car Series at Sydney Motorsport Park at the Sydney Retro SpeedFest on May 3-4. Keep checking back to the Heritage Touring Car website for more Car Profiles on interesting and important cars in the weeks and months to come.